I'm new to using Vuze, but I'm getting the hang of most of it. I've come across a snag and a question that I'm hoping can be answered here. 1. After my torrents are done downloading, they're not seeding. I don't know why. I never set any setting not to seed, yet my "Uploaded" and "Upload speed" remain resolutely at zero. What might my problem be? 2. Is it possible to have torrents load in Vuze without any interaction on my part whatsoever? Just click a magnet link and have it load in Vuze with all my default settings. I can set a default folder, but it still asks me to confirm it every time I load a torrent. Thanks for replying! I really appreciate the lent hand. 1. It could be you were right. I'm now seeding a new torrent that finished while I was out, and it's uploading (at a paltry 150 kB/s, but whatever). I'll keep an eye on this and see if it crops up again, or was just a problem wit the torrents I was using earlier. 2. It is set to "never again", and that prevents the window that offers me to choose which files in the torrent I want downloaded. But when I load a .torrent, I still get a "Save Torrent File In" window that comes up. I've linked to a screenshot of what I see. 3. Is it possible to load a torrent file without keeping the torrent file around? I.e. In the screenshot example above, is it possible to be torrenting "Music From" without actually maintining the "Music From" .torrent file around? I feel like it's just cluttering up the place since it's already been loaded in Vuze. Maybe I'm wrong, but I wanted to check. Might be your settings under Tools->Options->Files->Torrents ? You can do that when you download the .torrent file. Let me get an example together and I will post it for you. I normally have the radio button next to save file selected. In this case I clicked on the radio button next to "open with" and Vuze was already present. The file will get sent directly to Vuze and it will open in Vuze. Having said that I am not sure what the big deal is? The vast majority of .torrent files are less than 2 MB in size -- unless someone is uploading a huge torrent (say over 50 GB or so) and or a torrent which has a boatload of files (like say over 5,000 or so). If you are downloading average sized torrents of less than 4 GB or so . . . the .torrent file should be less than about 300 kB or so. It is really not a big space saver to not save the .torrent file is it? But there certainly is a way to open the .torrent files directly in your client. If the torrent site you are using supports magnet links you can use those instead of downloading the .torrent file as well. But back to the subject at hand what happens when you click on a link to download a .torrent file is a function of your browser . . . it is not a function of your torrent client. That screenshot I used above is from Vuze when I use a magnet link. I click on a magnet link, I get that pop-up box from Vuze asking where to "Save Torrent File In", I choose my Downloads folder, and the both the .torrent file and whatever I'm torrenting get dropped into my Downloads folder. What I want to do is (a) somehow bypass that pop-up from Vuze and just click on a magnet and have it load in Vuze w/o asking me any questions, and (b) not have it save the .torrent file when I'm using a magnet link in the first place. Thanks for trying to help, I do appreciate it! First off you are welcome! I am not much of a public torrenter. But I do not think what you are asking is possible. But like I said I do not do much public torrenting so I very well could be wrong. You still need a .torrent file somewhere. I guess Vuze could load the .torrent file directly into memory but I suspect that would be a hassle for someone to code. Even if it did do that you would still get a .torrent file somewhere on your computer . . . Vuze needs to store that information somewhere. 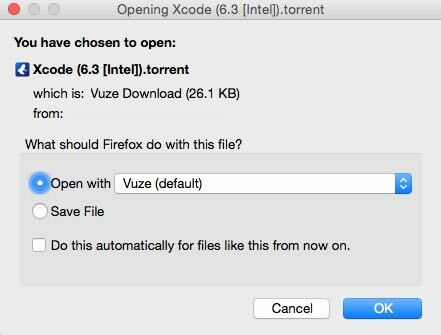 If the .torrent file was not stored somewhere what would happen when Vuze stopped for some reason (Vuze crash, OS Crash, power failure, whatever) and you wanted to restart the torrent? 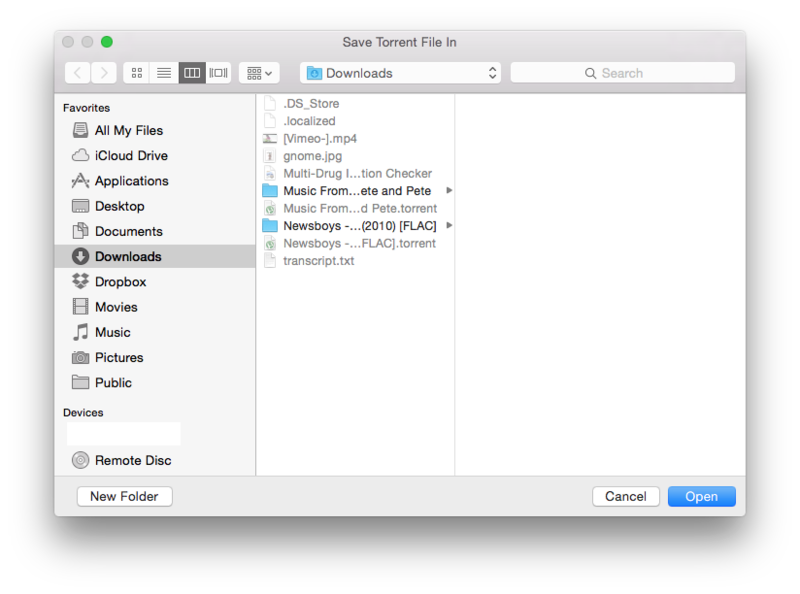 Again the .torrent file is a ridiculously small file. What exactly are you trying to accomplish? If you are trying to get better organization . . . I believe you can save the .torrent file to a different directory. But again I do precious little public torrenting so I use magnet links maybe in 1 download out of roughly 500 so my experience is pretty limited. At the very least once the .torrent file is downloaded and the torrent has started downloading in Vuze I think you should be able to move it elsewhere. At least you can do that with private .torrent files because Vuze makes a copy of the .torrent file and puts it in a Vuze specific directory. I am about 95% sure that would work with magnet link downloaded .torrent files.